The 'Three Peaks Challenge' team. 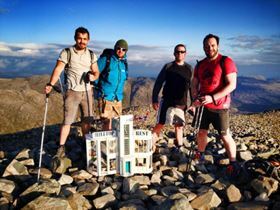 The Oil & Gas Engineering Team Leader from Coleford-based SPP, Chris Blinman and his team, have completed the 'Three Peaks Challenge' and to date has raised £2,000 for The Forest of Dean Children’s Opportunity Centre, also based in Coleford, UK. This challenge involves walking the highest mountains in Scotland, England and Wales within 24 hours. Chris comments: “What a great challenge this was. I did it with a team of four friends: Lee Jenkins, Rob Handcock, Ben Collins and our driver, Ian Jones. Ben is well known to many of the SPP team, as he works for PJ Engineering, SPP’s main site fabricators. The 30th annual Inpro/Seal VIP Charity Golf Tournament raised a record $23,066 for Aspire.